Home > Shop by Brand > Pinnacle Natural Brilliance > Pinnacle Black Label Collection > Pinnacle Black Label Diamond Coating Shampoo 32 oz. Leave nothing behind but the shine! The rich and luxurious suds created by Pinnacle Black Label Diamond Coating Shampoo begin to tell the story. The incredibly slick feel which allows your wash mitt to glide over the automobile’s body is a separate chapter. The way the suds freely rinse off the surface is the perfect ending. Pinnacle Black Label Diamond Coating Shampoo is a hyper-concentrated, extremely high-foaming shampoo designed to restore the impressive water beading characteristics exhibited by paint and surface coatings. Pinnacle Black Label Diamond Coating Shampoo is the perfect automobile shampoo. A high concentration of crystalline nano-polymers encapsulate road dirt and lift it from the surface. This slick barrier allows dirt, grime, road film and oil to be washed from the most delicate paint finishes without scratching, dulling the shine, or creating unsightly swirl marks. Car shampoos should do more than wash your paint, they should help protect it. Why use expensive crystalline nano-polymers instead of the typical soapy surfactants used in regular car soaps? Pinnacle Black Label Coatings crystallize as they cure, leaving behind a microscopic texture which is virtually unperceivable. This finish is what is responsible for the impressive water beading and sheeting effects exhibited by these products. Regular car soaps will coat over this finish, reducing the extreme water beading effect. 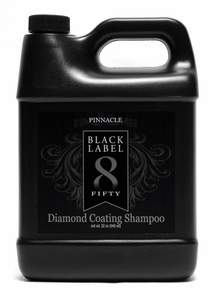 Pinnacle Black Label Diamond Coating Shampoo restores the original beading by rinsing away completely. One 8-ounce bottle of Pinnacle Black Label Diamond Coating Shampoo contains enough shampoo to wash your vehicle 16 times! This is because Diamond Coating Shampoo is hyper-concentrated. Just ½ ounce of shampoo is enough to create 3 gallons of solution. The thick, gel-like formula mixes effortlessly with water to create a mountain of lubricated suds. If you were to use Pinnacle Black Label Diamond Coating Shampoo strictly for maintaining coated cars, you would be missing out. The free-rinsing formula enhances the finish of any waxed or sealed automobile. Diamond Coating Shampoo has been carefully pH balanced, so it will not strip or reduce any existing carnauba wax or paint sealant layer. The crystalline polymers rinse away with ease, so you will be left with nothing but the shine. Pinnacle Black Label Diamond Coating Shampoo allows your wash mitt to glide over the paint, encapsulating and trapping dirt within the crystalline polymer structure. It then allows the dirt to be rinsed completely away, while water softeners reduce the chance of unsightly water spots. It is the perfect shampoo for the most discriminating auto enthusiast. Add ½ ounce of shampoo to your wash bucket containing 3 gallons of water. Activate the shampoo with a jet of water. Rinse the automobile first to remove any loose dirt and debris, working from the top down. Use a soft wash sponge or sheepskin wash mitt to wash, starting at the top and working downward. Rinse often and do not allow shampoo to dry on the surface. Dry the vehicle with a Guzzler Waffle Weave Drying Towel.